Swords clash in outstanding high-stakes combat. What is it? A challenging third-person action game about a shinobi on a quest for revenge. The enemy samurai fires a bolt from his enormous bow. I tap the parry button and slice the arrow out of the air. I know the shot is just cover for a sliding charging slash with his blade. It's two quick strikes, but I'm expecting it. I tap the block button twice to deflect both with a loud ringing sound and a flash of sparks. A glowing red symbol tells me that an unblockable attack is coming, an attack that has killed me three or four times before. The samurai lunges forwards with a thrusting stab. I press B at the last second and—this never gets old—my shinobi effortlessly steps on the blade and brings it harmlessly to the ground. My counter is rewarded by a loud boom noise. If this was an ordinary enemy I would press the right bumper and thrust my katana into their exposed neck for a brutal kill, foot still pressed down on their useless weapon. The boss just staggers back, resets his stance, and the battle resumes. Sekiro: Shadows Die Twice is the latest from Dark Souls developers From Software. It's set in a fantasy vision of Sengoku Japan, in the middle of a conflict between the Ashina and Hirata clans. You play a rogue shinobi called Sekiro—the one-armed wolf—charged with protecting a young lord who has the coveted power to defy death. It's more of an action game than an RPG. You pick up new prosthetic arms and learn new combat techniques, and even put skill points into a few upgrade trees. Don't expect to be fiddling with armour stats: this is a game about brief, deadly battles in an age of kunai and katanas. Sekiro's combat system is beautiful. Instead of chipping down health bars until the enemy keels over, you overwhelm their posture bar with strikes and perfect parries until an opening appears, and then finish with a deathblow. Enemy health bars are there to affect the amount of damage an enemy's posture takes. As you get slashes through an enemy's guard and damage them directly, they will take more posture damage from future attacks and recover more slowly. You can attack enemies with combos, special sword attacks, prosthetic gadgets and shinobi arts, but the aim is always to max out that posture gauge and get that final blow. I love the catharsis of beating a great boss in a From Software game. In Sekiro the deathblow system focuses all that emotion into one split second. After a tough encounter there's a rush of elation and relief when you see the glowing red deathblow reticle and hit the killing attack. Boss exchanges can be gruelling. 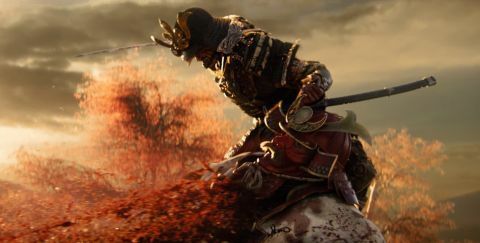 If you dislike using parry timings in combat—pressing the block button just as an enemy attack lands—then Sekiro might not be for you. Some bosses require you to consistently parry multiple combos. One fight in a tight space with a creature called Long-Arm Centipede Giraffe is basically a rhythm action sequence. You can't avoid their blitz of attacks; you just have to deflect them all in a shower of sparks and shwing swhing shwing noises. Precise deflections deal posture damage back to the enemy, and some enemies are designed to be defeated using deflections alone. It's a tough but incredibly rewarding system to master. It feels amazing to effortlessly deflect and counter enemies that were once a terrible challenge. Thankfully parry timings are generous and much more responsive than the vague shield-wave you get in Dark Souls. You can also hold block and then release-and-tap to get a parry, which keeps you relatively safe as you're learning enemy attack patterns. Enemies throw you out of blocking with special thrust, slash, and grab attacks, which have their own counters. You can step on a thrust, and you can jump over the slash, kicking off the enemy's head with a tap of the A button on a controller for a good dose of posture damage. You can use your dodge to avoid many grab attacks, but as you fight deeper into the game, expect enemies to start wrong-footing you with unusual attack patterns. You can counter with your increasingly powerful prosthetic arm. As you find upgrades you can return to your hub, the Dilapidated Temple, to have your gruff but caring sculptor friend install and upgrade them. Upgrades include an axe that smashes enemy shields, an unfolding metal umbrella that deflects gunfire, a device that throws shuriken (brilliant for knocking jumping enemies down mid-flight), and more that I won't spoil. You can switch between three at a time and swap those three around in the pause menu whenever you like. They are often designed to counter specific enemy behaviours, and an opponent that initially seems impossible can often be defeated easily with a specific prosthetic attachment—shield enemies are comically rubbish once you find the axe attachment. Sekiro ran at a flawless 60 frames per second for the duration of our playthrough. There seems to be a 60 fps cap, but modders are already creating workarounds that can give you frame rates of 100 or more. There is a wide range of advanced options for PC players, including a welcome setting that turns motion blur off—these combat animations are too pretty to smudge. This isn't a Dark Souls game, but Sekiro has plenty in common with the dark fantasy RPG series. Sekiro is made up of large but separate zones rather than a huge connected world like Lordran. Dark Souls fans will still enjoy the knotted structure of these areas, though, and there are many secrets hidden just off the critical path, often reached with the excellent grappling hook, which lets you vault between tree branches and rooftops using the left trigger. You will find yourself returning to old areas frequently to catch up with merchants and NPCs, who have their own mysterious needs and backstories. As ever with a From Software game, I feel like I'm skirting on the surface during the first playthrough. I expect it will take months of fans making connections for Sekiro's deeper stories to emerge. Sekiro's main plot is told through Sekiro’s conversations with the little Lord and other NPC hangers-on. Sekiro himself is also voiced, and plot development happens in conversations that occasionally offer multiple choice options. For the first ten hours or so I found the world itself to be quite bland—a mix of samey brown-hued townships with a slim selection of enemies. The variety expands enormously as the game progresses and beautiful new areas open up. Strangely, though the combat system is very challenging, Sekiro is less punishing than Dark Souls. The environments are bound together by Idols, which are the game's equivalent of Dark Souls bonfires. When you die you respawn at the last Idol you touched, but you only lose half of your money and some skill experience. 30 percent of the time you will get 'Unseen Aid', which means you lose nothing. Dying repeatedly reduces that percentage chance of getting unseen aid, but there's no way to get completely stuck in Sekiro. You can bank your money by purchasing bags of coin at vendors, and if you really want to buy something you can do a lap of an earlier area after popping a magic gold-boosting balloon. New skills are nice, but they are not crucial to progression. Importantly, stat boosts are tied to bosses. You can process memories of great boss fights to increase attack power and turn in prayer beads to increase health and posture. You get prayer beads from secret chests and one-off kills of tough ordinary enemies. That means you can't grind for stat boosts. Instead, the game is balanced around a predictable player power level. To me this a considerable improvement on the Dark Souls formula. It removes all anxiety about being under-leveled or under equipped: you just take on the challenge that's presented and improve your skill to progress. It helps that you can come back from the dead. Every time you rest at an Idol you restore up to one resurrection, but killing enemies charges up a second. You can't use multiple resurrections in quick succession, but they are a vital crutch and an interesting tactical consideration, especially during boss fights. Sekiro always presents you with multiple exploration avenues at the same time, so if you get stuck on one area, you can try to progress in the other, or backtrack to take on a miniboss that was too tough earlier. Stealth also takes the edge off. In some areas with a lot of ordinary enemies you can discover stealthy routes past them, which makes repetition far less dull. It's also fun to use stealth in combination with combat. I like to try to eliminate at least one member of a group with an instant stealth kill before blitzing the rest with my sword. Sekiro took me 73 hours to complete, but there are high level challenges hidden throughout that could add another ten before I plunge into new game plus. Sekiro's combat system serves up exciting new challenges to the end and the shinobi fantasy is powerfully realised in every savage deathblow and perfectly timed parry. If you're up for the challenge, Sekiro will reward your patience with some of the most spectacular, nerve-wracking duelling on PC.